Sara Berrensen, the talented artist behind the Sara B. 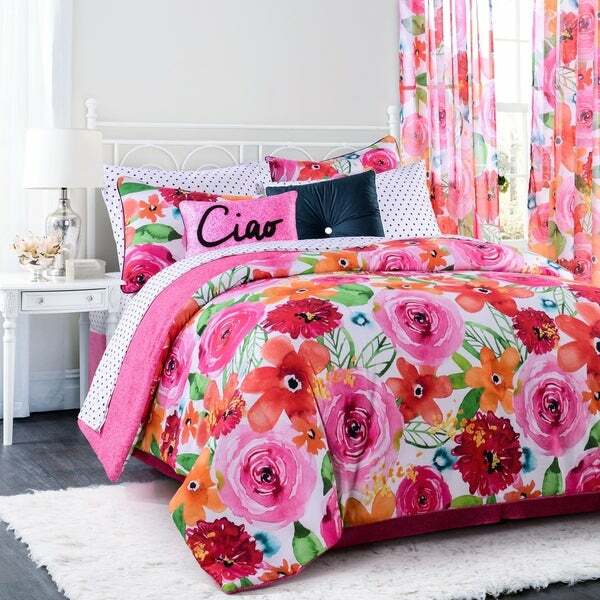 Home Collection has created this large, brightly colored flower patch in a hand-painted style all her own. The design is printed on an all-cotton fabric that enhances the lush colors and offers terrific hand feel. Complete the collection with the coordinating decorative pillow set, printed sheer window panels, and printed cotton sheet set, each sold separately. Dimensions 92.0 In. X 95.0 In. X 1.25 In. I hate giving bad reviews. First let me say that the set itself is beautiful. The colors are great. But the quality is not so good. There are rips that were sewn, that show. The stuffing isn't distributed evenly. And i would have returned it but felt like too much of a hassle. I'm sorry i paid as much as i did. It only got 3 stars because it is pretty. I don't know how to attach a picture. The bedding in prettier in person than online. I am ordering the curtains to match! Beautiful !!!!!!!! Cheerful!!!! Love it . So comfy and cozy.